Dave Collier first became interested in blacksmithing back in 1999 at a church picnic. A family friend was demonstrating S-hooks and roped him into trying one. He's been 'hooked' ever since. There is something very addictive about watching 2000 degree steel being bent and twisted as if it were soft clay. 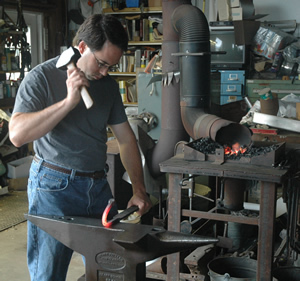 In 2001 Dave took Uri Hofi’s Beginner’s Blacksmithing class at Tom Clark’s Ozark School of Blacksmithing. At the time he had just finished his training to become a Physical Therapist. Hofi’s ergonomic hammering technique blended well with Dave’s professional training and he currently uses this system. In 2004 he began to forge iron professionally and now owns and operates Broken Hammer Forge. The name Broken Hammer Forge is a reference to Viking age Christianity. In the old days, Thor was one of their main gods and was particularly popular with the common man. As most people know even today, his iconic symbol was the hammer. When Christianity was first introduced, it was common for Jesus to simply be added to their current collection of gods. Since the Norse culture was polytheistic to begin with; what’s one more. Historic artifacts from this age have been found to bear both a Thor’s hammer and the Cross of Jesus. But if someone was seen wearing the Cross of Jesus and a broken Thor’s hammer that would symbolize they had fully committed to Jesus and had rejected the old ways. Dave's preference is to work in the traditional hot forging method although he does use some modern fabrication if the job calls for it. He makes a wide variety of items ranging from artistic pieces to small architectural work to knives. Dave also teaches blacksmithing classes with the intent of spreading the iron addiction.